Problem-oriented policing (POP) is a policing strategy that involves crime analysis and working with the community to develop effective response strategies to reduce crime. Many law enforcement agencies have adopted the POP concept as a way to reduce crime as well as build and strengthen community relations. This policing strategy was first introduced in 1979 when Professor Herman Goldstein from the University of Wisconsin-Madison published his research on problem-oriented policing. Goldstein’s research looked at the underlying problems that cause crime in a community and advocated that police take a proactive approach to investigating those issues, which in turn would also help build community relations. The theory and concepts of POP have since expanded. In 1987, National Institute of Justice (NIJ) researchers William Spelman and John Eck published Problem-Oriented Policing (PDF). Scanning: Crimes and problems are identified. Analysis: Crime patterns are synthesized to develop a well-defined problem. Response: Based on careful analysis by working with the community and businesses, a crime-reduction strategy is developed and introduced to address the identified problems. Assessment: The response is evaluated to see if the crime-reduction strategy was effective at solving or reducing the problem. Federal grant money makes it very enticing for local governments to adopt POP programs. However, several studies have indicated that such programs have varying degrees of success in reducing the underlying cause of crimes. Many police officers working under POP programs indicate that criminal behaviors are still present but that there are fewer arrests being made. 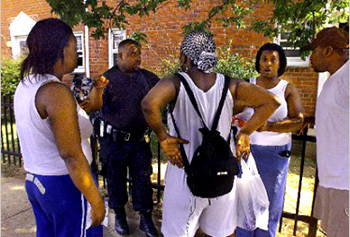 This is because officers are often encouraged by police administrators to use discretion in making arrests and instead turn to alternative measures such as displacement. Displacement is a police tactic that forces known criminals to stay out of jurisdictions or face a zero-tolerance policy for any infractions of the law. Such tactics force criminals such as drug dealers to move their operations elsewhere. There are no easy answers as to the cause of crime or the solutions. What law enforcement needs is independent qualitative research to investigate the human experience and perceptions of POP programs from all perspectives. Communities cannot rely on crime statistics because they can be misleading if departments are using displacement strategies to reduce criminal activity. Displacement is a Band-Aid, not a solution. With recent events drawing national attention to community and police relations, now is the time to build bridges and come together to make the community safe. We cannot simply displace our problems for another community or generation to address. What we need as a society is collaborative solutions and the courage to communicate in a respectful and meaningful manner to find sustainable solutions to crime and community-police relationships. Posted in Mark's Articles and tagged Corrections, Courts, Crime, Crime Scene, Criminal Justice, Criminology, Diversity, domestic violence, Ethics, Police, Sheriff. Bookmark the permalink.